More Italian-inspired food today, this time in the form of a cool, fruity frozen dessert that’s lighter than ice cream but far more rich and creamy than sorbet. It’s also much easier to make than those other two treats – no fancy-schmancy churns needed here but I was glad to be in possession of an electric whisk, I tell you. That’s the secret of a good semifreddo – whisking in air, and lots of it. By trapping as much air as possible in whipped yolks, whites and cream you create a fluffy mousse-like confection (and a lot of washing up!) that stays smooth once frozen. Being a ‘semi’ freddo, or half cold, you need to take your dessert out of the freezer a good half hour before serving to let it start to melt (or in my case, having what we affectionately call the ‘absolute-zero freezer’, a full hour). As for the flavour pairing, it’s one I don’t think we make the most of in the UK. Like so many other great pairings, fruits harvested at the same time often go together very well. 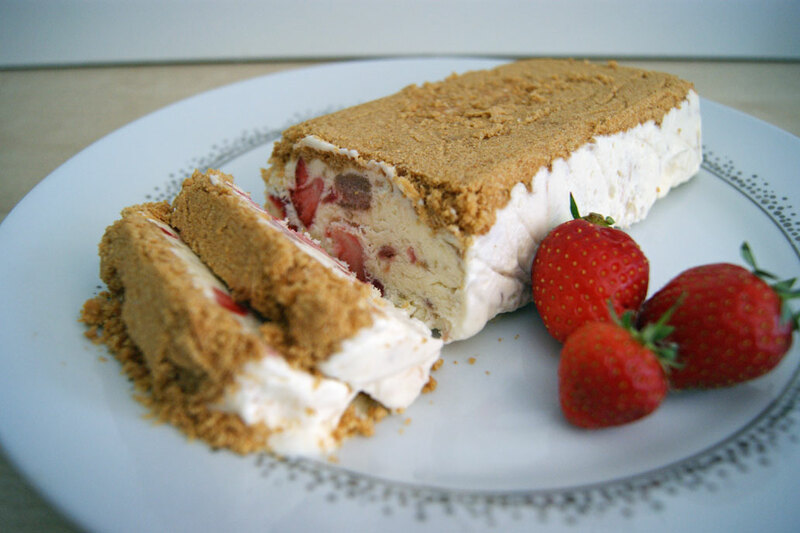 Rhubarb is at its prime and going cheap (£2 for a kilo or free if I butter up Mum) while British strawberry season is gathering steam so it’s the perfect time to make this summery recipe. I couldn’t resist adding another layer of flavour and texture with a dusting of crushed ginger biscuits on top but you could easily substitute shortbread for a more buttery crunch. Wash the rhubarb, pat dry and cut into 3cm lengths. Place in a non-reactive pan with 100g of the sugar, cover and cook over a gentle heat until the rhubarb is soft but still retains its shape. Set aside to cool. Once cool, strain off the liquid (which is nice served with the semifreddo or mixed with lemonade). Wash and dry the strawberries, cut into eigths and mix with 25g of sugar and the lemon juice. Leave to macerate while the rhubarb cools. 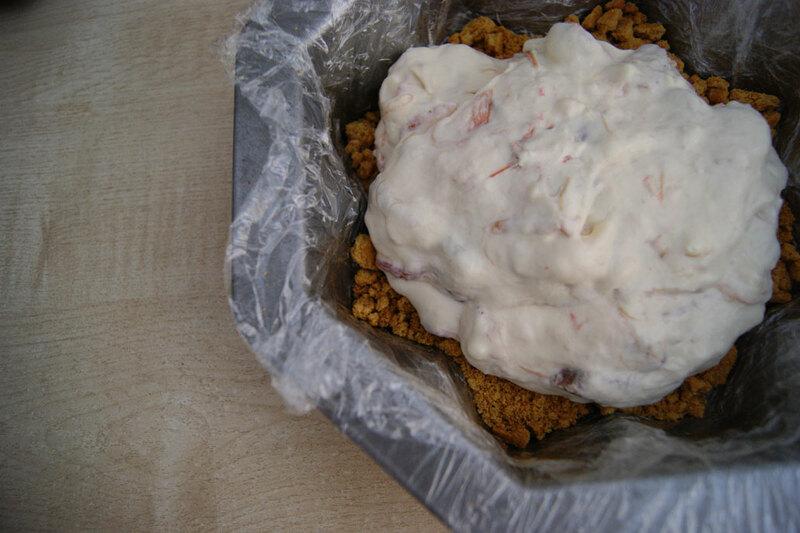 Once the rhubarb is cold, line a large loaf or cake tin with a double layer of cling film. The cling film will stick better and lay flatter if you rub a little oil on the tin before lining it. Sprinkle the crushed ginger biscuits over the base of the tin. In a large bowl beat the egg whites with a pinch of salt until firm. In another bowl beat the yolks and remaining sugar until pale and fluffy. In a third bowl whip the cream to peaks. Mix the yolks into the cream taking care not to beat out the air. Once combined, fold in the whites a third at a time. 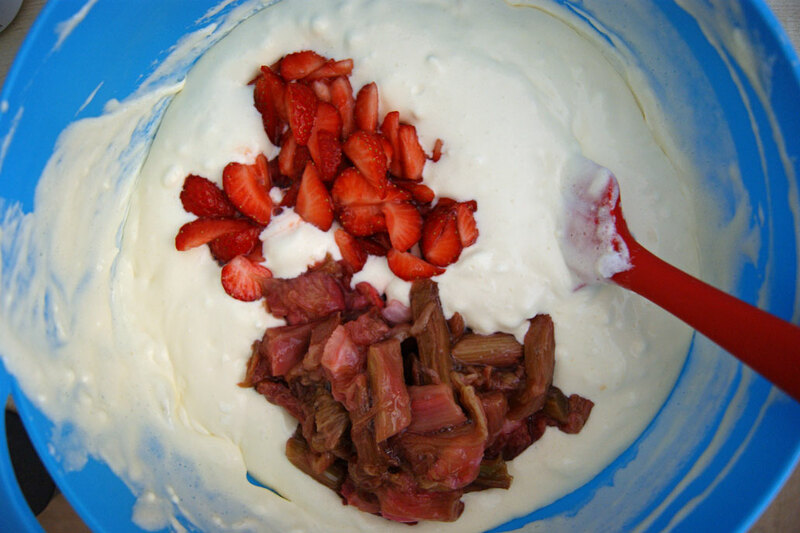 Gently fold the rhubrarb and strawberries into the cream mix then pour into the cake tin. Give the filled tin a firm tap on the counter to remove any large bubbles. Cover with clingfilm and freeze for at least 5 hours until firm. The semifreddo will keep frozen for a month. Half and hour before serving, turn out the semifreddo and remove the cling film. Rachel Allen has a good recipe for chocolate semifreddo, I think it’s on the BBC website. I’ve yet to make your apricot curd, I must give it a go!